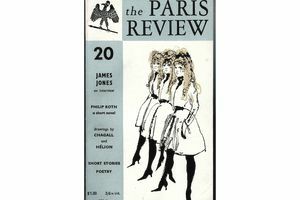 Founded in 1953 in Paris by Harold L. Humes, Peter Matthiessen, and George Plimpton, The Paris Review has become a legend among literary people. It's perhaps less well-known than The New Yorker, but more intellectual, and perhaps even more prestigious. The Paris Review introduced the world to writers like Adrienne Rich, Philip Roth, V. S. Naipaul, Mona Simpson, Edward P. Jones, and Rick Moody. And excerpts from books like The Basketball Diaries, The Virgin Suicides, and The Corrections graced its pages. They publish criticism and are renowned for their interviews, which continue to provide insights into the classic writers — Dorothy Parker, Katherine Anne Porter, and Ralph Ellison, to name a very few — who set the standards for contemporary literature. We strongly suggest to all who submit that they read the most recent issues of The Paris Review to acquaint themselves with the material the magazine has published. Please submit no more than one short story, one nonfiction manuscript, or six poems at a time. Be sure to include phone and (if possible) e-mail contact information. While the magazine welcomes unsolicited submissions, it cannot accept responsibility for their loss or engage in related correspondence. Rejected manuscripts will not be replied to or returned unless accompanied by a self-addressed, stamped envelope." "Prizes are awarded annually at the Spring Revel by the editors of The Paris Review. Winning selections are announced in the winter issue. No application form is required. The Hadada Award is presented each year to “a distinguished member of the writing community who has made a strong and unique contribution to literature.” Previous recipients of the Hadada include John Ashbery, Joan Didion, Paula Fox, Norman Mailer, Peter Matthiessen, George Plimpton (posthumously), Barney Rosset, Philip Roth, Norman Rush, James Salter, Frederick Seidel, Robert Silvers, and William Styron. The Plimpton Prize for Fiction is an award of $10,000 given to a new voice published in The Paris Review. The prize is named for the Review’s longtime editor George Plimpton and reflects his commitment to discovering new writers of exceptional merit. Past recipients include April Ayers Lawson, Amie Barrodale, Jesse Ball, Emma Cline, Caitlin Horrocks, Atticus Lish, Alistair Morgan, Ottessa Moshfegh, and Benjamin Percy. The Paris Review recognizes humor, wit, and sprezzatura as important qualities of good writing. The Terry Southern Prize honors work appearing in the last year, either in the ​Paris Review or the Paris Review Daily, that best embodies those qualities. It is given in memory of our loyal contributor Terry Southern, known for his uproarious fiction and journalism and such screenplays as Dr. Strangelove and Easy Rider. Past recipients include Elif Batuman, J. D. Daniels, Ben Lerner, Mark Leyner, and Adam Wilson."